It seems that Dragons will have a big part in Rastakhan's Rumble as this versatile and cheap Neutral minion can Discover a spell if you are holding a Dragon! We haven't seen any Dragons revealed so far, but it's safe to assume that they will have some kind of presence in Rastakhan's Rumble. People are already thinking that Dragon Warrior might be a thing, due to the reveal of Smolderthorn Lancer. The Discover component of this card makes it very versatile and probably a staple in Dragon decks to come, since it's undeniable that Dragons will keep being printed in future expansions. 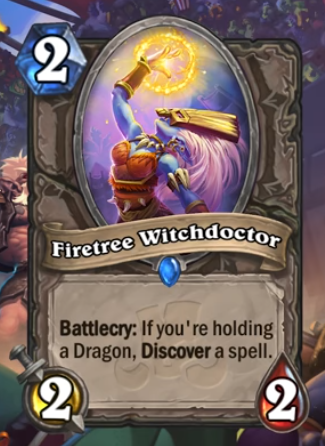 The potential is definitely there, but without having seen any other Dragons from the upcoming expansion it's difficult to talk about which classes Firetree Witchdoctor can find a home in.